Successful use of a slayer weapon, spellbook, or musical instrument will yield a little white flash on the monster. The Slayer property can be found as a rare drop in monster loot or crafted by a character when using Runic Tools. Slayer instruments can only be found on monster loot. A slayer spellbook however can only be crafted by scribes using a scribe pen (assuming they have a high level of magery) or in artifact form. Player crafted spellbooks have a chance to have properties from any slayer groups. You must have the spellbook equipped to receive the double damage bonus from most direct damage spells, and slayers granted by spellbooks only effect spells that make use of Evaluating Intelligence in their damage formulas (notable exceptions are Mind Blast and Harm). Note that Necromancy and Spellweaving spells are also not included. There are two types of slayers, Super Slayers and Lesser Slayers. Super Slayers are effective against a large group of different, but racially or elementally similar, creatures. The Super Slayer comes in two forms: Talisman-based and instrument/spellbook/weapon-based. Talisman Slayers do not affect spells. The Damage Increase from both talisman-based and instrument/spellbook/weapon-based forms is cumulative, or stacks, subject to the 300% cap. The following Super Slayers primarily are found on Talisman: Bat, Bear, Beetle, Bird, Bovine, Flame, Ice, Mage, Vermin, & Wolf. The following Super Slayers primarily are found on musical instruments, weapons, and spellbooks: Abyss, Arachnid, Elemental, Fey, Repond, Reptile, and Undead Slayer. Initially, the Slayer property was called Virtue Weapons, applied only to melee weapons, and operated in a far different manner than currently. The very first Slayer weapons in the game were Undead slayers, but were known as Silver weapons. Publish 16 (July 12-22, 2002) saw the introduction of Slayer Musical Instruments. They they worked the same way as Slayer melee weapons. However, they increased the chance of a successful use of the Barding skill that was mentioned in the tool tip, instead of doing double damage to the creatures for they were meant. The Ultima Online: Age of Shadows (February 2003) expansion changed the way Slayer weapons work, to the current manner. The Slayer Spellbooks were released with Publish 31 (March 17, 2005) as part of an attempt to make mages more balanced in PvE. Super Slayers apply to whole groups of creatures. The Lesser Slayers are creature specific. They will say the name of the creature then slayer. For example: "Lizardman Slayer." Until the Stygian Abyss expansion, all Slayers did double damage to applicable monsters. However, following that expansion, Lesser Slayers do triple damage, and Super Slayers still do double damage. 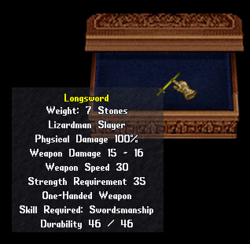 The manufacturers stated explicitly that this was intended to increase the value of the Lesser Slayers, which were increasingly looked down upon by players (with a few notable exceptions, such as Scorpion Slayer, Spider Slayer, and Dragon Slayer, all of which had particular uses). This page was last modified on 9 November 2013.